It is only now, some 18 months after the London 2012 Olympic Games ended, that the Park’s most show stopping architectural attraction has been revealed. The billowing wave-shaped roof of the London Aquatics Centre, spanning some 120m and held up by just three concrete supports, is a true feat of engineering, which ­remained largely concealed during the Games due to the presence of the two box-shaped spectator stands clamped to either side. These have now been replaced, as part of the building’s comprehensive transformation into legacy mode, by two huge faceted curving glass facades which flood the interior with light and give the impression that the dipping and diving roof hangs in mid air. This ‘floating’ effect is enhanced by the thin self-supporting frames of the facades, made up of trussed steel alloy columns and slim-section transoms and mullions, which cantilever at a 15 degree incline and have no permanent physical connection to the roof. 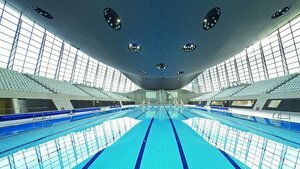 The Aquatics Centre reopened to the public on March 1, giving visitors the chance to experience the thrill of leaping from an Olympic diving board or swim in the pool used by the athletes for just £4.50 a ticket. The transformation began at the end of last year when the stands on the east and west elevations were peeled back to reduce the building’s seating capacity from 17,500 to 2,500 and make way for 628 panes of double-glazed laminated glass – 314 on each side. The two facades, supplied and installed by Austrian contractor Seele, are conical in shape and cover a total area of 2,800m². The glass walls had to accommodate movements in the roof, which is similar in design to a bridge and stands on giant bearings that allow it to slide. This creates huge dead load deflections of between 285mm and 435mm which are resolved using a clever 3D joint concealed in a box within the shadow gap at ceiling level. The joint is fixed separately to the facade and roof, and allows the roof to move in two directions. Flexible ­insulation completes the thermal envelope. The columns stand on large steel base plates, needed to support the sheer length and weight of the cantilever. Inclining the ­facades means that they meet the roof well back from its edge, which has the effect of blurring the edges of the building and ­enhancing the sense that the interior swimming pool space connects to the outside. A drainage trench runs along the outside of the facades and a heating trench on the inside. ZHA spent a long time rationalising the facade design. Initial plans which introduced movement into the facade itself were rejected in favour of a more straightforward infill design that would not compete with the roof for attention. The simpler design allowed the team to drive efficiency into manufacture by increasing the repetition of glazing panels, which was considered key to making the legacy scheme stack up financially. Although most glazing panels are identical in size – around 1.5m by 3m – variations were required at the tops of the facades to adapt to the more complex curving roof geo­metry. Top panels are smaller and partially concealed inside the deep shadow gap in the timber ceiling to give the impression that the roof directly butts up against the glazing. In legacy configuration, the Aquatics Centre is a BREEAM Excellent project. The facade panels’ U value of 1.4 W/m²/°C is low compared to regular double glazed units, and their air permeability value is no more than 5m3/hr/m2. ‘The sheer size of the space means it experiences a lot of solar gain, which to an extent balances out thermal heat loss through the facades,’ says Heverin. A closed circuit radiator system in the trussed framework, developed by Seele and based on ZHA’s initial concept, circulates hot water to create a constant temperature across the surface of the glazing, reducing the risk of condensation and down draught. In addition, the glass panels feature a screen-printed dot matrix pattern, which varies in across each elevation, to help control daylight levels and restrict potential glare, particularly around the diving boards. The pattern is invisible externally and can only be seen from the pools close up. The finished building is hard to fault. The facades have an precision engineered beauty that is reminiscent of Joseph Paxton’s ­Crystal Palace or William Barlow’s train shed roof at St Pancras; their clean horizontal lines in dynamic tension with the dramatic sculpted roof above.